For nearly a decade, parents (and their clinicians and referring professionals) have turned to the JCAHO-accredited Optimum Performance Institute (OPI) to help their young adult find the emotional stability, balance and direction they seek. Men and women ages 17-28 come to us from throughout the world: From homes, residential treatment centers, wilderness programs and hospitals. 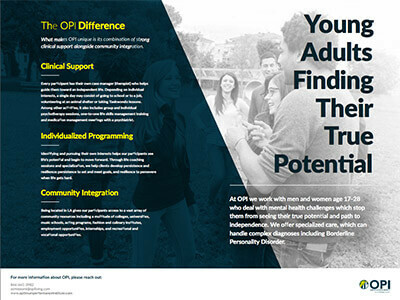 When we realized that the comprehensive skills, curriculum, rapid stabilization and integration techniques we developed over the years also were needed specifically by young adults diagnosed with Borderline Traits, Borderline Personality Disorder (BPD) and co-occurring conditions, we opened our Breakthrough OPI Intensive program as an integrated, sub-specialized part of OPI. were not moving forward with their lives. Why is OPI Intensive Successful? One therapist/case manager per participant throughout their stay. Dialectical Behavior Therapy (DBT) and Mindfulness techniques are combined with techniques for individuation perfected over time by the Optimum Performance Institute. Together they mobilize young adults to find direction, balance and greater responsibility for their lives. One DBT-trained Independent Living Specialist for every two participants ensuring continued oversight and safety. Beautiful, staffed Apartments (genders are separated) with swimming pools, workout rooms, etc. Opportunities for access to a plethora of activities at OPI and greater L.A. area. Participants also engage in our specialized Mindfulness Techniques such as yoga and equine therapy. Here, OPI Intensive helps the Emerging Adult rapidly integrate into ‘the real world” by finding direction and success in academics, setting a professional direction and establishing a supportive, healthy peer network. They continue practicing DBT skills, Mindfulness and Continued Stabilization Skills while working with our seasoned Departments of Education, Career Development, Volunteer Services and Extracurricular Activities. Over the years at OPI, these special “agents of change” have accumulated a plethora of resources, contacts and mentors in the greater Los Angeles area to help participants develop a career goal, complete their education and start having small successes as they begin moving forward. Participants learn to set and meet goals, persevere and realize that anxieties about the past and future don’t have to prevent them from experiencing joy today and discovering a life worth living. Your son/daughter will learn competencies at life skills, how to organize their time and address tasks whether for school or work. They will learn to find new interests, hobbies, and opportunities to help others, and to uncover and pursue their passions. This is the process that makes Dialectical Behavior Therapy (DBT) stick: OPI Intensive teaches participants how to apply DBT to their real life so they can begin to move forward and become independent. What Will be the End Result from the Program? We work toward helping young adults transform and learn how to become more mindful of his/her situation. We help them begin responding appropriately to challenges, frustrations, and changes: In short, we help him or her become capable of taking charge of his/her own life.